WASHINGTON DC, Jan 25 2018 (IPS) - Indigenous Peoples and local communities are some of the best environmental stewards. Their livelihoods and cultures depend on forests, clean water and other natural resources, so they have strong incentives to sustainably manage their lands. 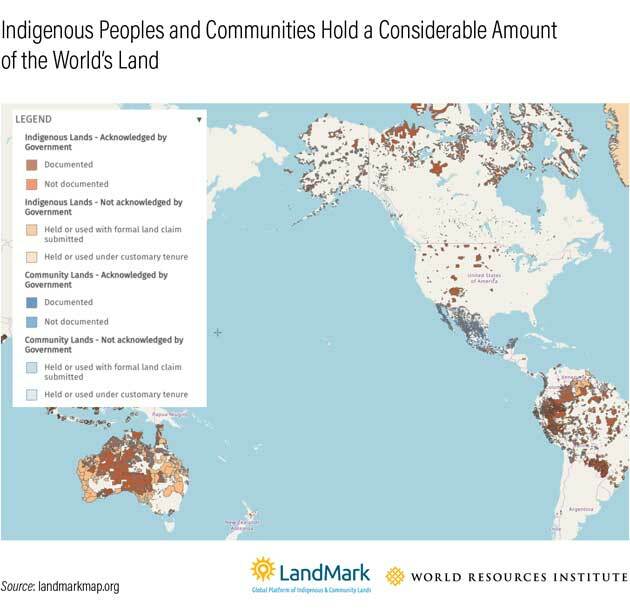 LandMark, the first global platform to provide maps of land held by Indigenous Peoples and local communities, last month released new carbon storage, tree cover loss, natural resource concessions, dam locations and other data layers that shed light on the environment in which these lands exist. Now anyone, anywhere can view and analyze indigenous and local communities’ environmental contributions and identify threats to specific lands. 1) Indigenous Peoples and communities hold a considerable amount of the world’s land. More than 50 percent of the world’s land is community land, collectively held by Indigenous Peoples and other local communities and managed primarily under customary tenure arrangements. The map below shows indigenous land in orange and community land in blue across Amazonia, with the darker colors indicating lands documented with a title or land certificate. Community land is found on all continents of the world, except Antarctica, with Africa having more than any other continent. However, Indigenous Peoples and other communities hold legal rights to only a fraction of the lands they occupy; even less of their land is formally registered and documented with the government. This makes community land vulnerable to being taken by governments, corporations and other powerful elites. 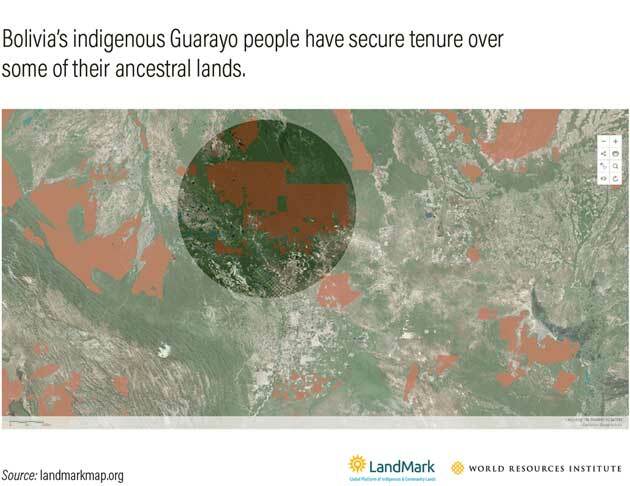 2) Tenure-secure indigenous lands often have lower deforestation rates than other areas. Rapid deforestation accounted for 80 percent of Bolivia’s total annual carbon emissions from 2000-2010, and forest loss isn’t slowing down. Farmers and cattle ranchers are clearing more and more forests, especially in Bolivia’s Santa Cruz province (shown in map below), where soy production is booming. However, deforestation is significantly lower within formally recognized indigenous-held lands. A recent WRI report found that in Bolivia, deforestation rates are 2.8 times lower within “tenure-secure” indigenous lands — lands that are legally recognized by the government and protected from external threats and competing claims — than outside of them. By giving indigenous groups legal rights to the lands they occupy, Bolivia could avoid 8-12 megatonnes of greenhouse gas emissions each year, equivalent to taking more than 1.7 million vehicles off the road. These benefits extend beyond Bolivia and across the Amazon — average annual deforestation rates inside tenured indigenous forestlands were 2-3 times lower than outside of them from 2000 to 2012. Securing these lands would generate billions of dollars in climate, environment and economic benefits over the next 20 years. 3) Indigenous Peoples manage some of the richest carbon stocks in the world. Research shows that indigenous and community lands store about 25 percent of the world’s aboveground carbon, making these lands critically important in the global fight to curb climate change. For instance, the Ikahalans in the Philippines have protected their ancestral forests for generations. 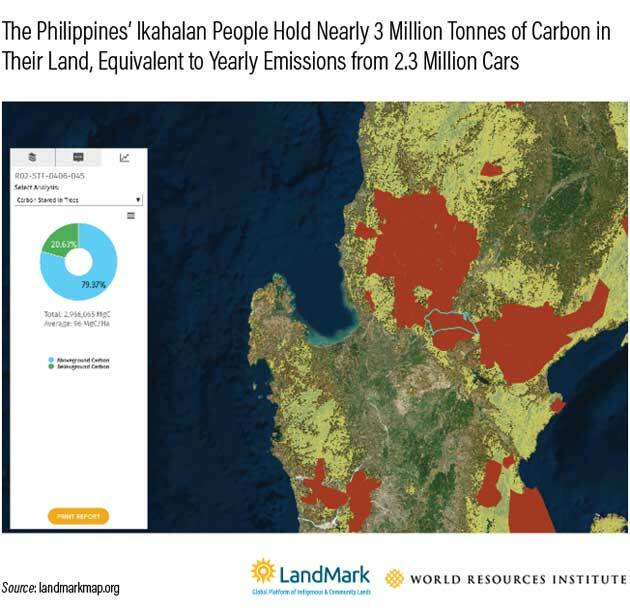 LandMark’s new carbon storage analysis tool estimates that the trees in the Ikahalan’s domain (outlined in blue in the map below) holds nearly 3 million tonnes of carbon, with an average of 96 tonnes per hectare across their entire territory. The total carbon stored in their lands is equivalent to the yearly greenhouse gas emissions from 2.3 million passenger vehicles. By providing this data, LandMark can help communities like the Ikahalan access additional sources of income through forest conservation programs like REDD+ or carbon accounting and sequestration projects. 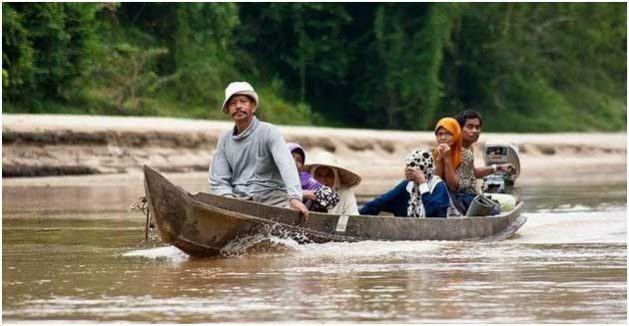 4) Dams are flooding indigenous and community lands. Around the world, dams and hydropower projects have flooded collectively held lands, including homesteads, family farms, burial grounds and sacred sites. In the Brazilian Amazon alone, more than 80 large dams are currently under construction. 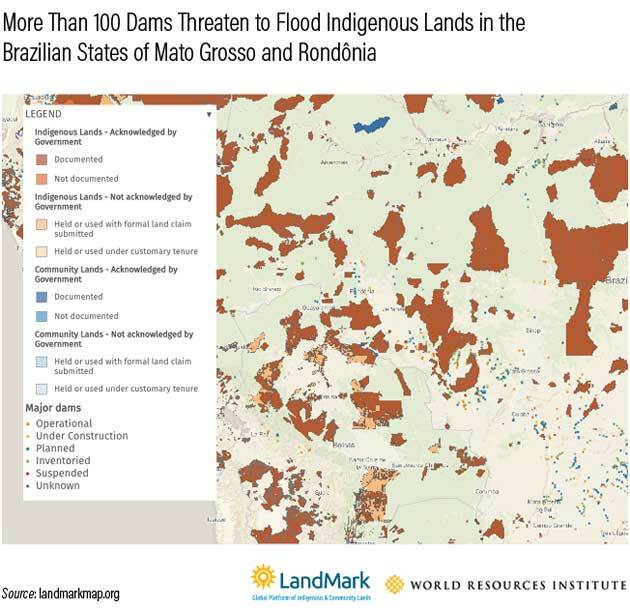 The map above focuses on the Brazilian states of Mato Grosso and Rondônia, showing projects that threaten to harm rivers, destroy forests and create significant hardships for Indigenous Peoples. In these two states, 20 large dams are under construction, 86 are operational and an additional 224 dams are either inventoried or planned. 5) Natural resource concessions are a growing threat to indigenous and community lands. Mining for precious metals such as gold, copper and zinc is among the most widespread threat to indigenous lands, particularly in the Amazon. In Peru alone, the government has granted some 55,000 mining and exploration concessions that cover more than 18.5 million hectares, about 15 percent of the country. The map below shows the indigenous Santiago de Chocorvos land, which has 95 concessions on it. Illegal mining, not illustrated on the map, also runs rampant and threatens local communities across Peru. The short-term profits of mineral extraction usually spell long-term hardship for Indigenous Peoples and communities; companies clear forests and pollute waterways, leaving little left to support traditional livelihoods. Titling of community lands and the right of Free, Prior and Informed Consent (FPIC), which gives communities a powerful voice in all decisions affecting their lands, is paramount for preventing the widespread loss of critical ecosystems. Maps are a powerful tool for making visible the lands that Indigenous Peoples and local communities hold. 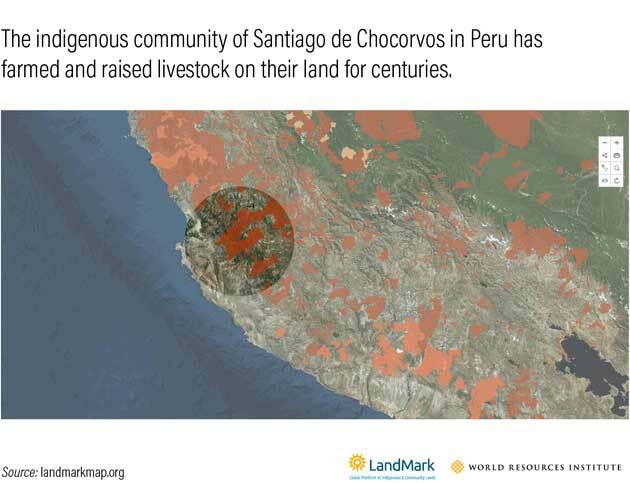 LandMark shows the dynamic environment in which these lands exist – both the benefits that they provide when land rights are secure, as well as the mounting pressures that threaten rural livelihoods and the planet. These communities and their advocates can use the platform to help protect indigenous land rights, negotiate fair payments for land use, and participate in decisions that affect their lands and livelihoods.